The VIP guests included Yb Datuk Dr. Abu Bakar Mohamad Diah Deputy Minister Of Science, Technology And Innovation, Yang Berusaha Dr. Zulkifli Mohamed Hashim Deputy Secretary General (Science), Ministry Of Science, Technology And Innovation, Malaysia (MOSTI). Other guests of honor that were also present included Yang Amat Berbahagia General Tan Sri Dato' Seri Panglima Mohd. Azumi Bin Mohamed (RETIRED) Chairman Of The Board Of Directors, Cybersecurity Malaysia; Yang Berusaha Dr. Amirudin Abdul Wahab Chief Executive Officer, Cybersecurity Malaysia; Mr. Ewan Ward Chairman, Asia Pacific Computer Emergency Response Team (Apcert); and Eng. Badar Ali Said Al Salehi Chairman, Organisation Of Islamic Cooperation Computer Emergency Response Team (OIC-CERT). General Tan Sri Dato' Seri Panglima Mohd. Azumi dedicates a song to his wife. One of the highlights of the night was when General Tan Sri Dato' Seri Panglima Mohd. Azumi belted out a few of his personal favourite tunes on stage. The crowd applauded as he dedicated the first song to his wife. 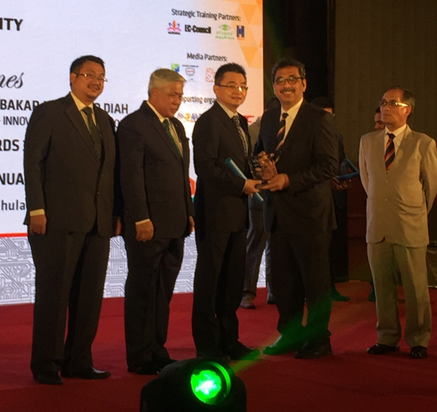 The night ended on a high note, and we hope Eduspec can be a part of the Malaysia Cyber Security Awards again next year. 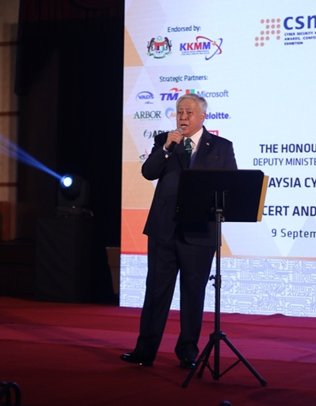 The Malaysia Cyber Security Awards aims to honour individuals and organisations who contributed to Malaysia's cyber security or information security. The awards are conferred in recognition of their innovativeness, commitment, industry/product/service leadership, and sound business strategies. For details, please visit www.csm-ace.my/awards.html. Want to catch the action on the award night? Watch it here!